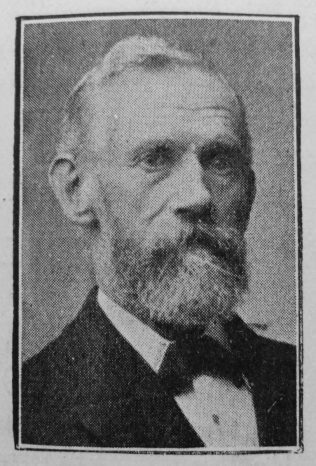 Brother Jonathan Gerrard was born at Little Hulton, Walkden, in 1834: he lived a strenuous and remarkable life, and passed away in peace on December 28th, 1906. His parents held a licence to sell drink, and apparently there was no religious influence about the home. Our friend, however, must have been a studious, serious youth. He made the utmost of the educational advantages of the village school; and at the age of eighteen he was converted at a Walkden Camp Meeting. He was not apprenticed to any trade, but was introduced by an uncle to some experience in the work of a carpenter and builder. This experience he so utilised that he founded one of the largest building firms in Manchester. In the Chorley Road Society, Swinton, he was one of the pioneers, making, with his wife, who was ever a real helpmeet, great pecuniary sacrifices for the cause. He filled with marked usefulness the offices of Class Leader and Sunday School Superintendent. In 1871 Mr. and Mrs. Gerrard started a new Society in another part of Swinton, to which they had removed. From the first it prospered, and under the name of Manchester Road Church, it is now a centre of great spiritual activity. From 1871 to his death, he was a class leader and a school Superintendent in the Manchester Road Society. When the Manchester Eighth Circuit was formed in 1891, Mr. Gerrard became the first circuit steward, holding this post also until his death. He was also for many years a member of the District Committees. Our brother was a most devout and conscientious man. Such was his spiritual enterprise and his rooted aversion to debt that his church from time to time has erected property worth over £4,000, every part of which has been opened free of debt. He was remarkably industrious, cheerful, and generous. His family are all earnest members of our church. Of his daughters, two became wives of our ministers, viz., Revs. W.H. Mason and W.M. Kelley; while the other daughter is the wife of one of our local preachers, Mr. Herbert Marsh. There are also three sons, one of whom, Mr. T.L. Gerrard, succeeds him in the Circuit Stewardship, and all of whom are officials in the Manchester Eighth Circuit. We were hoping to celebrate in April, 1907, the Golden Wedding of Mr. and Mrs. Gerrard, but it was not to be. And God’s ways are best. Jonathan was baptised on 14 December 1834 at Horwich, Lancashire. His parents were Thomas, a weaver, and Mary. Census returns identify the following occupations for Jonathan. He married Jane Lee (1834-1911) on 19 April 1857 at St Mary, Eccles, Lancashire. Census returns identify seven children.